As the world now well knows thanks to the precedence set by companies like Google, the face of architecture is changing. Tech firms in particular have been on an unconventional design binge, demanding their architects to produce wide open spaces conducive to communication, collaboration, and top of the list – comfort. Commercial architects aren’t the only ones being called upon to create spacious, inviting environments which encourage their inhabitants to kick back and enjoy a natural position perfect for reading, working on the computer, or just taking a rest. Open floor plans have been dominating the homebuilding scene for quite a few years now, and believers are enlisting the help of architects to craft amazing spaces filled with indulgent details and unconventional furniture. While there have been some naysayers who see these design trends as disruptive and just a little too unconventional for their tastes, the results are in from many of these firms, and those results are positive. Companies hiring architects to redesign their buildings into virtual playgrounds are finding that the payoff is strong employee loyalty, higher productivity, and perhaps most telling – bigger profits. The concept behind the evidence is that comfort begets creativity – people feel abler to relax and allow their productive juices to flow when they’re physically at ease. 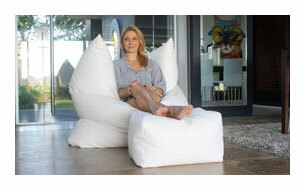 Bean bags facilitate this level of relaxation by surrounding workers in soft, gentle support, encased in cheerful colours which soothe and inspire. Versatility – With a generous variety of shapes and sizes, from the humble ottoman to the multi-seater chair, bean bags can work in any room, and be easily moved from place to place to accommodate rearranging. Colour choices – No matter what the décor, from understated modern sophistication to bright and bold children’s spaces, there’s a bean bag colour available to add just the right touch to the room. 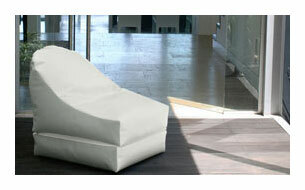 Innovation – Non-traditional furniture is on the cutting edge of architecture and design. Different is in, and bean bags deliver on this movement. Not to mention they’re fun and functional! Whether you’re redesigning your business space, or creating a mind-blowing home theatre, you’ll want bean bags that not only offer comfort, but are beautiful, durable, and easy to clean as well. Bliss gives you the style options and colour choices you want and need, in truly inspiring products made with care right here in Australia. Our industrial-strength vinyl is soft and inviting, yet stain-, abrasion-, and fade-resistant, plus anti-microbial and simple to clean. Our seams are sewn with extra strong nylon thread, and you can choose from our expansive collection of colour options, including two-colour designs if you desire. Personalise your bags with your company name (or your family name! ), favourite sports team logo, virtually anything you could dream up. Ride the wave of architectural ingenuity by utilising the highest quality bean bags available in Australia in your home or office.